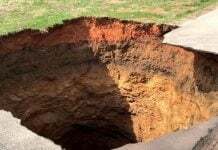 A sinkhole in Williamson County, Texas is exposing a 22-foot-deep and 170-foot-long cavern, which reaches underneath three homes in the Brushy Creek neighborhood. The hole opened up Thursday morning in the 8400 block of Cambria Drive. On Friday, geologists mapped the cave and are now calling it Cambria Cavern. 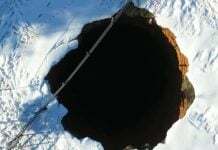 “We don’t have sinkholes. This is Texas, this is Central Texas,” said Michelle Mitchell, who lives three doors down from the sinkhole. Mitchell laughed in disbelief when she was first told a sinkhole had opened up into a cavern on her street. But after walking down to see it for herself, her reaction changed. On Friday Cambrian Environmental released new pictures of the cave. It’s up to 22 feet deep and stretches for 170 feet. The entrance to the cave is next to water and gas lines. The three chambers of the cave extend east underneath three houses. Mitchell’s home is by the smallest chamber that is eight feet deep. Jenny Laseur lives near the cave, though her home is not directly over it. “Is this the first of many, or the last of it,” Laseur said. Geologists from Cambrian Environmental spent Friday mapping the cave. A white line in the middle of Cambria Drive is the starting point. Other than the collapse area, the cave experts think the limestone is thick enough underneath the road to remain stable. 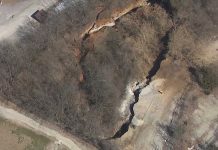 “There is at least five and one-quarter feet between the roadway and the cave, so there is some depth there,” said Connie Odom, spokesperson for Williamson County. The geologists also gauged the integrity of the ceiling of the cave underneath these three homes. “They do not feel concerned for the areas that are further back. They don’t see that the ceiling in the areas further back have a disturbance,” said Odom. Just a few miles away, you can spot tourists and field trip groups at Inner Space Cavern. 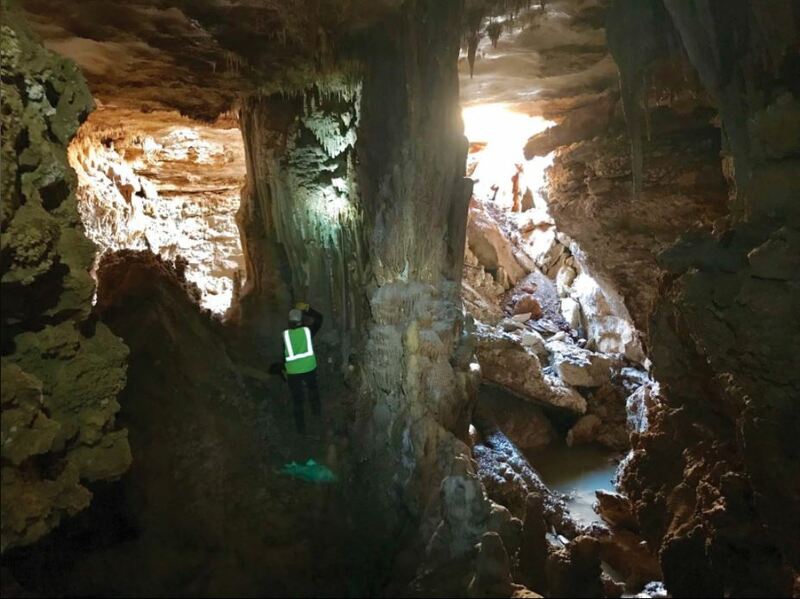 “We have a lot of limestone, and with that we have a lot of caves,” said Taunya Vessels, the cave’s general manager. 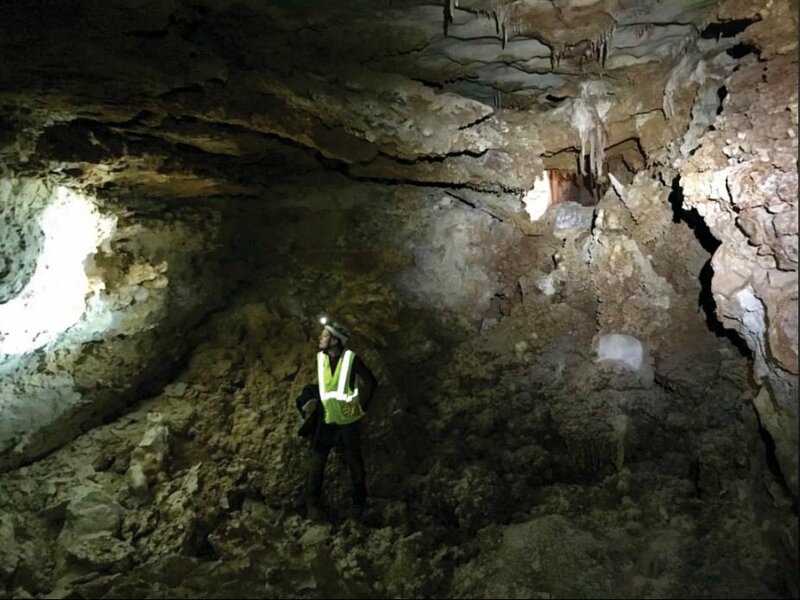 There are hundreds of caves in Williamson County. The inside of Inner Space Cavern will likely look a lot like the inside of the cave under the Brushy Creek neighborhood. The biggest difference is the space between the cave and surface. While the cave under the Brushy Creek neighborhood has a little more than five feet between the surface and cave, Inner Space Cavern has more than 33 feet. “I don’t really know much about that situation but when you have five feet that’s not going to be as much strength as 33 feet,” said Vessels. For now, Mitchell and her family are staying put. “I’m fine with it. I’m not worried about it,” said Mitchell. But she would like a list of the do’s and don’ts of living on top of a cave. She would also like to see Williamson County install underground reinforcements to keep another hole from opening up. On Monday, structural engineers will be brought in to determine the cave’s stability. 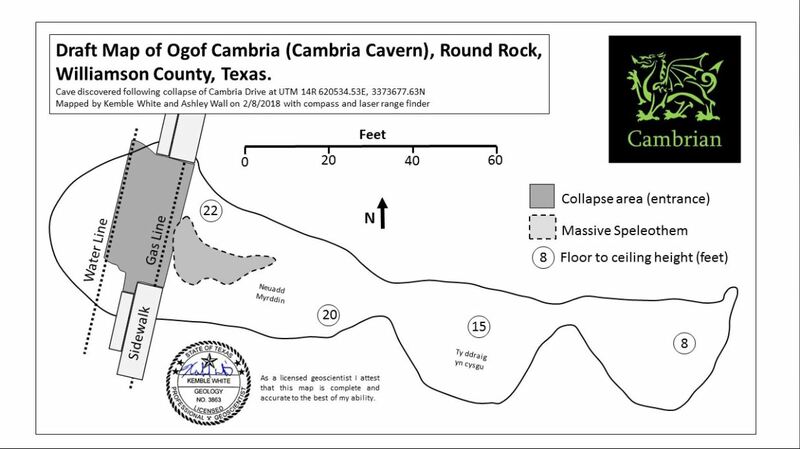 The image of Draft map of Cambria Cavern on this page has the symbol of Draconian (the most vicious cannibalistic reptilian with wings). The winged Draconian is the highest rank reptilian among species of reptilians. That means that this cave belong to draconians. I believe this neighborhood is colonized by draconians and hybrids. They shapeshift into human, or they ride the human clone they created. But still they are cannibalistic. Their houses should have access to this secret cavern system in this neighborhood. I have checked around this area. Inner Space Cavern is located about within 10 miles from this Cambria Cavern. These 2 caverns should be connected. Around here, there should be a huge cave system for draconian species. There are couple of huge quarries next to Inner Space Cavern. That means the quarries are the places they get rid of the dirt out of their underground base construction with cave system. Draconian people in Texas know about it well, and spending in those cave system is part of their everyday life. But they don’t tell you about their cave systems. Just like they don’t tell you that we are their food and slaves. (I live adjacent to the cave) I posted your comments to our neighborhood’s website, and they got a big kick out of your comments.